Filters Bio Fuels : ARK Petroleum Equipment, Inc. Specifically designed for renewable fuel filtration. Detects phase separation and reduces flow in Ethanol blended gasoline up to E20. For use with high concentration bio-fuels, Ethanol E20 to E100, Methanol M20 to M100 & Biodiesel B20 to B100. Special adaptors are also available. Case of 12 300MB designed for gasoline service station pumps, commercial fueling dispensers, most Dresser and Tokheim Service Station dispensers. High performance particulate removal Bio-Tek Spin-on Filters are not to be used with aviation fuels. Case of 12 400MB designed for gasoline service station pumps, commercial fueling dispensers, most Gilbarco Service Station dispensers. Case of 12 475XLMB designed for gasoline service station pumps, commercial fueling dispensers, most Gilbarco Service Station dispensers. Detects phase separation and reduces flow in Ethanol blended gasolines up to E20. High performance particulate removal Bio-Tek Spin-on Filters are not to be used with aviation fuels. The Centurion I has a single 1" npt filter housing with a replaceable element for filtration of gasoline, diesel fuel, and fuel oils. The Centurion I is designed for service stations, truck stops, and commercial high-speed dispensing applications. 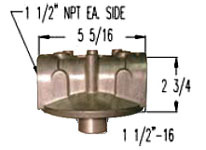 A nominal 10 micron element is recommended for gasoline and diesel fuels. A nominal 30 micron element may be preferred for heavier distillates such as diesel fuel and fuel oils. A nominal 2 micron element is available for greater filtration efficiency. Consult the factory for oil and methanol applications. The Centunon I is not to be used with aviation fuels. The Centurion III has a Dual 1 1/2" npt filter housing with a replaceable elements for filtration of gasoline, diesel fuel, and fuel oils. The Centurion III is designed for service stations, truck stops, and commercial high-speed dispensing applications. 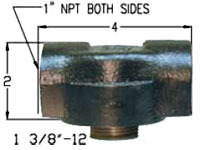 A nominal 10 micron element is recommended for gasoline and diesel fuels. 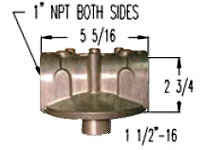 A nominal 30 micron element may be preferred for heavier distillates such as diesel fuel and fuel oils. A nominal 2 micron element is available for greater filtration efficiency. Consult the factory for oil and methanol applications. The Centunon III is not to be used with aviation fuels. The Centurion IV has a tripple 2" npt filter housing with a replaceable elements for filtration of gasoline, diesel fuel, and fuel oils. The Centurion IV is designed for service stations, truck stops, and commercial high-speed dispensing applications. 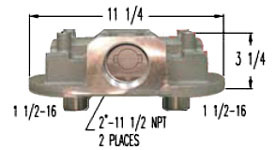 A nominal 10 micron element is recommended for gasoline and diesel fuels. A nominal 30 micron element may be preferred for heavier distillates such as diesel fuel and fuel oils. A nominal 2 micron element is available for greater filtration efficiency. Consult the factory for oil and methanol applications. The Centunon IV is not to be used with aviation fuels. E-10M Element for Particulate Removal High-Performance Microglass. The Viking 1 & Viking 1F (Flanged) filter housing are capable of filtering gasoline, ethanol blends up to E15, biodiesel blends up to B100, diesel fuel, ultra-low sulfur diesel (ULSD), and fuel oils. Industrial fluids such as lubrication oils, hydraulic oils, synthetic oils, transformer oils, many solvents, and thinners may be filtered. Perfect for bulk fueling racks and bulk fluid transfer. The Viking 2 & Viking 2F (Flanged) filter housing are capable of filtering gasoline, ethanol blends up to E15, biodiesel blends up to B100, diesel fuel, ultra-low sulfur diesel (ULSD), and fuel oils. Industrial fluids such as lubrication oils, hydraulic oils, synthetic oils, transformer oils, many solvents, and thinners may be filtered. Perfect for bulk fueling racks and bulk fluid transfer. The Viking 3F (Flanged) filter housing is capable of filtering gasoline, ethanol blends up to E15, biodiesel blends up to B100, diesel fuel, ultra-low sulfur diesel (ULSD), and fuel oils. Industrial fluids such as lubrication oils, hydraulic oils, synthetic oils, transformer oils, many solvents, and thinners may be filtered. Perfect for bulk fueling racks and bulk fluid transfer. 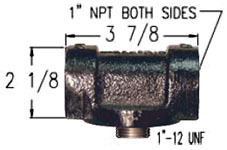 The Viking 4F (Flanged) filter housing is capable of filtering gasoline, ethanol blends up to E15, biodiesel blends up to B100, diesel fuel, ultra-low sulfur diesel (ULSD), and fuel oils. Industrial fluids such as lubrication oils, hydraulic oils, synthetic oils, transformer oils, many solvents, and thinners may be filtered. Perfect for bulk fueling racks and bulk fluid transfer. Starting at $29.85 Viking Elements are available in a variety of Media and micron ratings. Cellulose Media for Particulate Removal. Hydrosorb for Water Detection and Particulate Removal. Microglass for High Performance Particle Removal with ethanol blended fuels. Twelve 32 ounce bottles pers case. Each bottle treates 80 gallons of water. Hydroburn fuel treatment is scientifically formulated to break the weak hydrogen bond between water molecules... and then becomes a combustible compound that liberates the water molecule as steam in the exaust. HYDROBURN eleminates water and water related problems when applied correctly!! Period. HYDROBURN improves fuel quality and promotes more complete combustion. Twelve 32 ounce bottles pers case. Each bottle treates 250 gallons of diesel fuel.